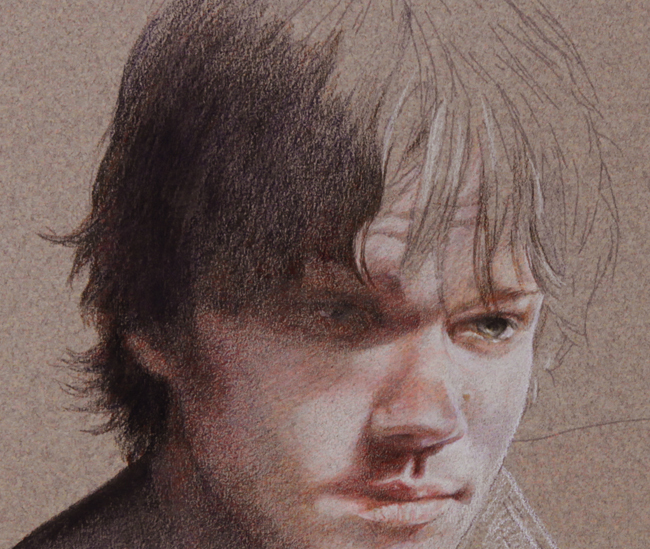 I began this project way back in February, before I had finished my Dean colored pencil portrait. I had been working only on the Dean portrait for many months and even though I was pretty close to finishing it, I needed a break. 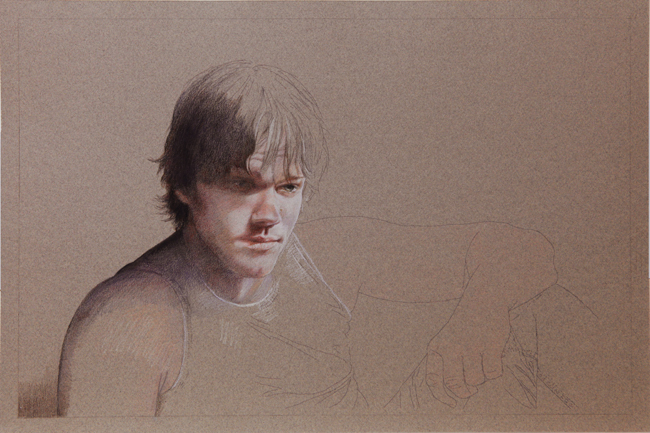 Sam in Shadows was the result of that desire to work on something different. 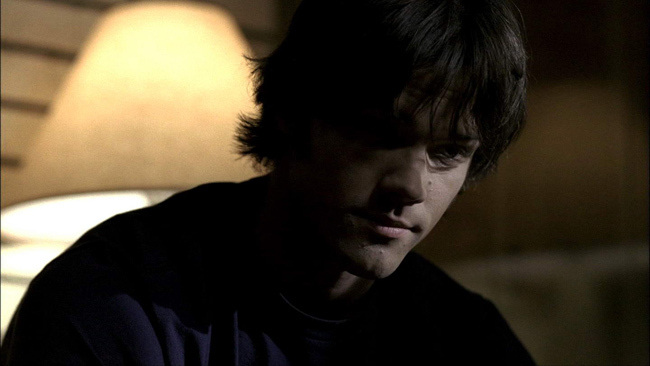 I was thinking that it would be nice to try something on plain old Canson Mi-Tientes paper and so started looking through my Sam reference photos for something to spark my imagination. I found a great close up shot of his face, very dark and moody and thought it would be great to try it on a darker toned paper. I lined up some other reference shots and came up with digital collage of body parts and Sam's face that allowed me to create this sketch. You will quickly notice he does not have a right eye. 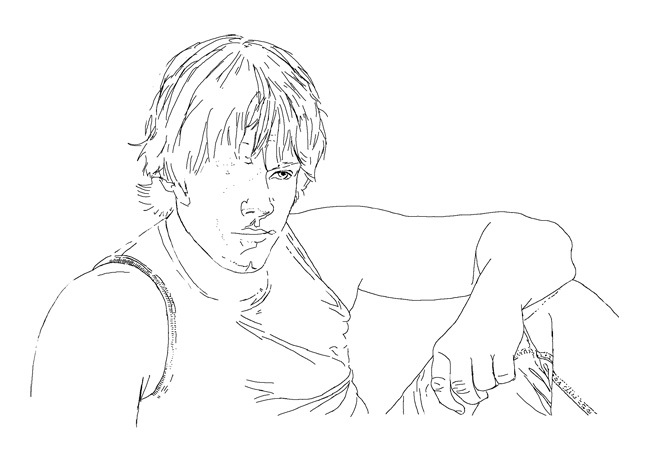 I broke one of my own rules by embarking on this project without having a good reference image for a face. The picture that captured my imagination is great, but unfortunately rather low res and missing some vital information like where exactly his right eye is situated and where the top of his head ends. But being forever optimistic I figured my own version could just extrapolate (i.e., make a wild guess) about the missing parts. This is the picture I used for Sam's face. My powers of extrapolation failed me. I was able to complete the head contour but every attempt to draw in a guideline for the right eye were pretty ghastly. I resolved to put in a big old dark shadow there. This is what came of my initial burst of work. The funny thing was that when I started putting in the colors on the paper and working the shadows I was able to get a much better feel for where the eye should be. I took my Sam reference and adjusted the levels down in Photoshop until I was at least able to discern an eye shaped blob down deep in the larger shadowy blob. This helped me feel my way to drawing in a more believable eye shape there. Who knows, if I am able to get the whole drawing as dark as I would like to, I may end up darkening the left eye out just like in the reference. But at least I now have the option to have a semi believable shadowy eye there in case I don't. A few things I forgot to mention, the paper is an 18 x 12 brownish grey toned Canson paper. Since it is 12 inches wide I was able to print my sketch directly onto the paper with my large format Epson 2200 printer. I printed the line drawing in draft mode, and with the opacity down to 30% in Photoshop. It gave me a line I could clearly see but that won't be too difficult to cover up with the colored pencils.